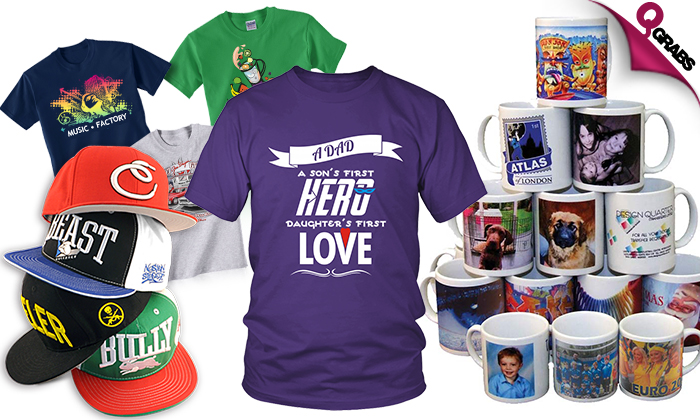 Customized Printing on Mugs, T-shirts & Caps! Option 1: Cup is included and can be chosen at the shop. Customers can choose a plain ceramic mug or the black magic mug. Get a regular ceramic mug or a black magic mug with your own personal photo or design printed on it. Plain ceramic mugs can reveal a personal photo or a design of yours with the heat and reveal technology. When the cup is room temperature, the image is hidden but when hot liquid is poured into the cup the image appears. Cup is included and can chosen from the wide range of products available at the shop. Digital A4 sized print on the front side of the t-shirt. Ideal for wearing on special occasions & events. A picture can be printed on a white coloured t-shirt. Other coloured t-shirts can have logos & text printed as per your preference. T -shirt is not included. Choose from a range of plain cap colors in the shop and get your favourite design embroidered on the front portion of the cap. The cap is included in this option. Make gifts personal with 50% off! In No Mind is Qatar’s favourite store for unique gift products & electronic items, metal engraving,printing etc. The store is In the ground floor of City Center Mall.